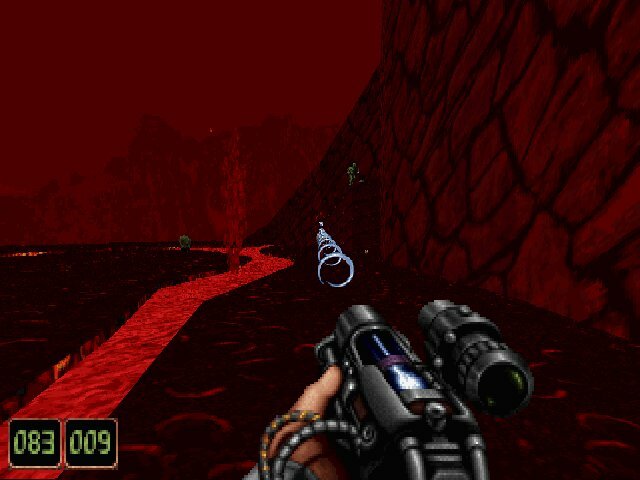 The first person shooter was, and still is, a bloated genre. But damned if they aren’t early technology adopters, and at the forefront of game engine development. That’s certainly what Duke represented in 1996 – a significant, incremental step toward creating a smooth engine and areas more realistic and urban than those in Doom. The humor and zaniness of the Build engine games are more of a stylistic bonus, while the action taking place in its environments is always enjoyably fast and brutal. You should expect nothing more and nothing less with this game, Shadow Warrior. Build3D does kung-fu films. You play as Lo Wang, an assassin working for the Zilla Corporation. The readme alludes to your years of loyal service and history of unspeakable deeds, all of which are quickly forgotten when you discover the Corporation using black magic to spawn Hell in the basement. You put in your two weeks, Zilla puts in the order for your death. As usual, the story is only relevant to understanding a handful of muttered soundbites from your character, and a few CG cutscenes along the way. It also serves as a keen explanation for why you’re carving up demon ninjas instead of true humans, and thus, assist the game in getting away with the ultraviolence it does. 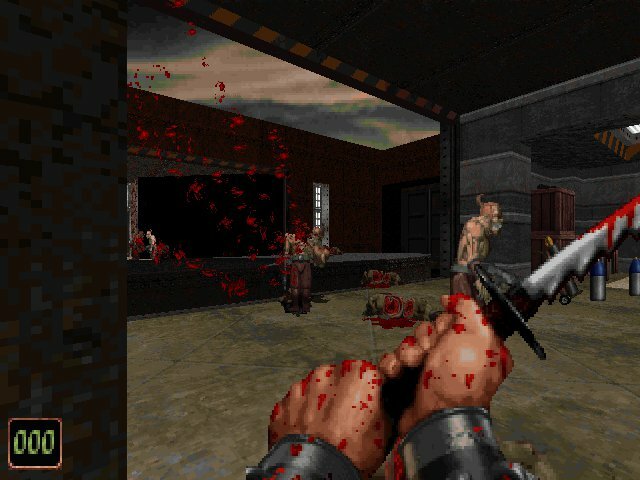 If you’re used to Duke3D or Blood, you’ll quickly recognize the same style and overall “feel.” You utilize some truly off-the-wall weapons against a gallery of vile creatures, watch them spurt blood and gib to clipped wisecracks from your avatar. Along the way, you can smash just about any object in the environment, and trigger explosions to blow preset holes in walls. It’s good fun and fast action, even if there might not be much to differentiate it from the previous two Build titles. Personally, I believe that Build’s ability to render incredibly diverse, rich arenas bests any of the early true-3D titles. Quake’s action is impressive, but its visuals are bland. Build titles, by comparison, are full of crucial variety. 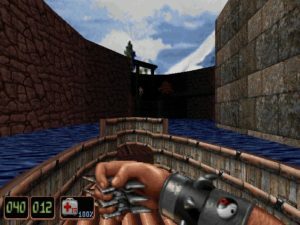 Take some of the classic showcase levels as an example – the boardwalk in Blood, the space station in Duke, the villa, underwater base, and clouded volcano in this game. You’ll get no brown castle walls and barren corridors here. 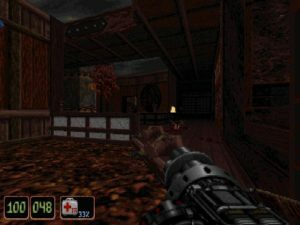 Though Shadow Warrior’s lack of true 3D rapidly becomes apparent, it looks real enough for my tastes, and a damn sight better than the repetitious dungeons of contemporary FPSs. Such strong attempts at rendering real-world locations are likewise paired with the expected Build antics. Barrels blow pre-scripted holes in certain walls. Levels deform in response to triggered events. Lights can be activated, and pachinko machines can be played (and won). Instead of hitting toilets to regain health, Lo Wang can punch a Wing Chun dummy. Crafty ghost enemies make use of their 2D nature to turn “invisible.” And the engine is also not without some improvements. You’ll see some reflective floors, voxel-rendered 3D pickups, transparent water (when the architecture allows it), and even some working vehicles like boats and forklifts. These machines exist in the world as 3D objects you can climb aboard, activate, and spin around limited tracks. Puzzles also make clever appearances, outside of the normal key and switch hunts. You’ll press blocks in sequence, maneuver pillars into place, even remote-control an RC car to drive a key under a door. Shadow Warrior’s not just about the action that takes place within its levels, the levels themselves get in on the fun. 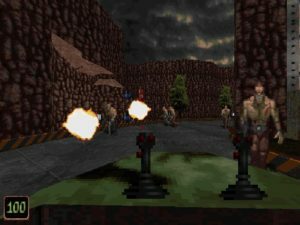 If you can get over the fact that it’s not true 3D, and have any interest in these kinds of classic shooters, Shadow Warrior’s worth a play. The railgun from Eraser even shows up. Of course, these puzzles and interaction act as an added bonus to the main attraction of first person shooting. Shadow Warrior isn’t likely to disappoint in this regard. It’s as competent as the tops of the class, and makes itself distinct with its creative combination of ninja-themed weapons and Western artillery. You have throwing stars, caltrops, smoke bombs, and a razor sword early in the game. You’ll quickly move on to double-fisted Uzis, a shotgun with a four-chambered revolving barrel, and the delightful spike mines that stick to most surfaces. By the time you get to the flamethrowing head, deadly autonomous clone of yourself, and portable nuclear missile launcher (which usually manages to kill you too at harder difficulties), your tongue should be firmly in cheek. Almost all weapons have an additional fire function, increasing their adaptability to wider situations. The missile launcher cycles through three different kinds of ordinance. The shotgun fires one barrel at a time, or all four at once for tougher foes. You can select two uzis at once, or drop to one to conserve ammo. 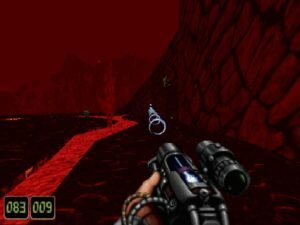 These are all selected by pressing the number key for that weapon again, with a corresponding visual change to the gun model, such as an LED illuminating. This makes it easy to see which setting you’re currently on, and the limited settings (usually two per gun) means you can cycle between them as easily as you would switch to a new weapon. Limited vehicle sections always give the opportunity to throw some ordinance at unnecessary bad guys. Humor is where the game stumbles most. In an attempt to be just like Duke, the basic comedic tools of wisecracks and visual puns within the levels continue to be the game’s only source of chuckles. Put it another way – it’s lousy with Asian jokes. Get ready for lots of “bhrokan Engrish,” naked anime babes, and fortune cookie health bonuses. Right from the start, Lo Wang’s taunt “Who wanta some wang?” will give you a good idea of what you’re up against, and the rest of the adventure is appropriately juvenile. You’ll even encounter roaming bunnies that hump each other when they cross paths (“Oooh! Holny labbits!”) and the old “Cream of Sum Jung Gai” on a menu. The cracks here are possibly too low-brow. Such comments and self-reflection was refreshing for Duke, compared to earlier, more straightforward shooters. Caleb’s lines were a gas in Blood, and pretty much made that game. 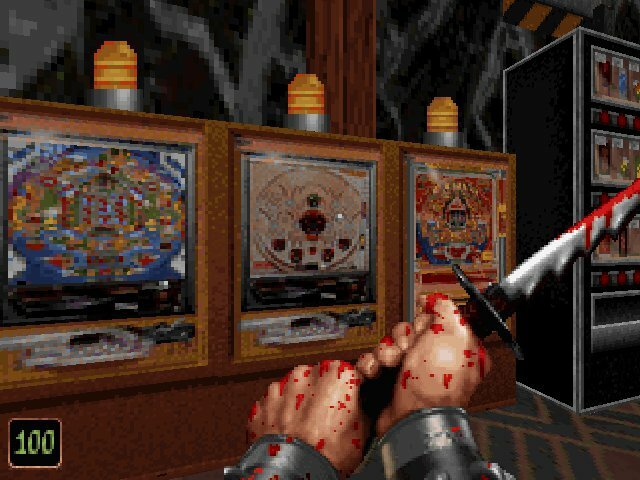 You might be bored with it by Shadow Warrior. Not to mention, neither of those titles hit anything close to racism. Here, well, your mileage will vary. I also noticed fewer movie references, or levels based on classic films. Maybe I just missed them, but that was another enjoyable point from the previous games that seems limited here. Controls are the same as previous Build games, with a full keymapper in the setup program. The only thing worth noting here is that Shadow Warrior, perhaps responding to Quake’s competition, attempts to be far more 3D and stretches its technology in places the other Build titles avoided. Enemies often appear on ledges above and below you, in cramped quarters that require you to look in their direction instead of simply backing up and letting auto-aim do its job. Mouselook in Duke was more of a novelty than a requirement, but not so here. You’ll need it to crack at least three puzzles. You’ll especially rely on it when handling the grenade launcher, as you must elevate your view to properly hook shots around corners. Since Build isn’t true 3D, you’ll see a distinctive warping every time you try to do this, and it’s the only visually sour part of an otherwise rich game. Shadow Warrior’s many temples are some of the prettiest spots in the game. Sound is a high point, with excellent music that streams off the CD. Most is subdued atmospherics played on classic instruments like the shamisen. Occasionally you get some rock-style themes with the same instrument selection but more bass and “power.” Effects seem taken from the Build library. Explosions, brass, ricochets, blood, and groans are appropriate, but nothing special. Lo Wang’s actor (John Galt) delivers his lines with an impish glee, if you can overlook him doing his best attempt at Mickey Rooney in Breakfast At Tiffany’s. In general, the audio supports its visuals well. It sounds dismissive to call this a “Kung-fu Duke Nukem,” but honestly, that’s pretty much the score. You have inventive weapons, you have plenty of action, you have a character with some snappy lines and a love of big guns. Any distinctively Japanese weapons get passed over by the end of the first level, and the monsters you splatter them with could just have easily come from outer space instead of some kind of oni conjured up by Zilla’s meddling. However, excellent texture work and a few digital pictures of art and statues give Shadow Warrior’s levels a distinctive style. If you’re looking for more of the same action in new locations, this is much more complete than a simple expansion pack for Duke Nukem. But if you’re bored of this gameplay, or never liked it to begin with, this is absolutely just a continuation of Duke’s successful style. Generally excellent level design. Impressive new effects, vehicles are limited, but fun. Copies Duke, but offers enough original material to get by. More of the same. Stretches Build’s 3D mimicry to the breaking point during normal gameplay. Less emphasis on jokes and pop culture references makes it a little bland, while “edgy” race gags stand to backfire.